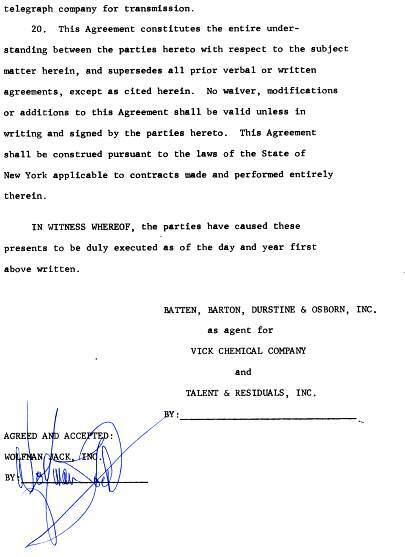 Nine page contract promoting Clearasil Acne Ointment signed by Wolfman Jack in 1975. 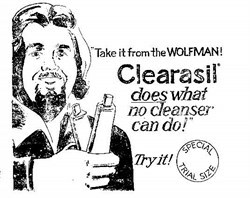 Wolfman Jack was one of the most influential and recognizable rock 'n' roll disc jockeys in America, and later television, during the 50s through the 70s. The radio announcer developed an eccentric on-air personality punctuated by trademark wolf howls. His most significant radio engagement began in 1960 on station XERF, in Via Cuncio, Mexico, just nine miles south of Del Rio, Texas. Playing a mixture of R&B, rockabilly, jazz and rock 'n' roll, and shouting in black-influenced slang, Wolfman drew a huge audience. In 1972, the Guess Who paid tribute to him with a song, "Clap For The Wolfman". The following year he had a small role in the popular film American Graffiti, and during the same period he began a nine-year association as host of the live music television programme The Midnight Special.